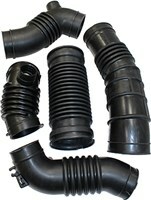 Dayco Air Intake Hose range is manufactured to OEM specifications and make/model specific. The purpose of the air intake system is to provide clean, cool and dry air for the engine. The Air Intake Hose is an important component within the Air Intake System, the Hose delivers fresh filtered air to the combustion chamber. The Hose is durable, however fuel economy and the overall performance of an vehicle can be effected significantly when cracks and wear are evident. To ensure continual engine efficiency Dayco recommend the damaged Hose be replaced immediately.